This just came in from the Telegraph, apparently Mars Exploration Rover Spirit has spotted a random skull on the Martian surface. 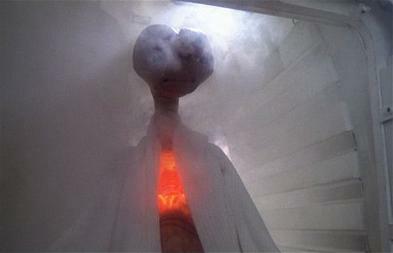 This is obviously the only interpretation… as we know what an alien looks like, don’t we? Big head, big eyes, pasty grey skin. Something like this? Or, more likely, like this? Or this? Wow, it could be any one of them. However, it’s not quite that exciting. Although the newspaper’s article resembles a badly conditioned April Fools gag, there is one glaring error, well two actually. No, three. Firstly, Spirit is not a camera – it’s a whole robot with a camera attached (called the Panoramic Camera, or Pancam for short). If it was just a camera, could you imagine the movie location costs? Second, I’m not sure why this was filed in “Science News”. It obviously needs to be filed under “It’s a Slow News Day, We’ll Report Anything”. And thirdly, I seriously doubt this image got “space-gazers talking”. When I last looked at one of Opportunity’s panoramic shots, I could see all kinds of strange things in the Mars dirt. If I was a conspiracy theorist, I’d love poking around the shapes and shadows, thinking I could see skulls, flying hubcaps and mysterious plant-like features. But I’m not a conspiracy theorist, I’m a “space-gazer”, but I’m not “talking”. A stone. On Mars. Might look like a skull. Doesn’t really. Even ufologists don’t take it seriously. So it’s not really news. Move along. I’m not suggesting the Telegraph isn’t a good newspaper, on the contrary, but really, what’s the point? silly peapole, its not an alien skull its a left over piece of the fake moon landing they did on mars! Hi,Excellent post. Keep up the working and looking forward to more great articles in the future. No it was ashton cucher you just got punked. I think we must go to find out the more details about this skull.but this is not a skull.your kidding. This was too funny. Can't imagine who would think that looks like a skull, better yet an alien skull. Don't they know that alien skulls are more oval? LOL… Silly people.